Develop strategies to mitigate the potential risks. 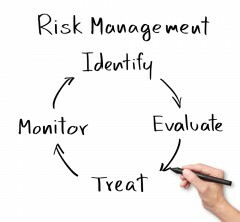 Taking a cold hard look at your facility from a risk management point of view is the first step in developing a risk management plan. Take some time to tour each area of your facility and imagine what possible hazards could possibly arise in each area. One of the most common issues involving locker rooms is insufficient supervision. No matter how great your gym members are, it only takes one bad apple to assault someone or cause some sort of damage or disruption. Make sure a staff member is present or conducts a security check at regular intervals. Where there is water, there is always the risk of a slip and fall injury, and gym members must assume that risk. If it is exacerbated by the presence of standing water or soap, however, that’s another story. Ensure adequate drainage of all shower areas, including walkways between showers and other facilities. Have staff keep an eye out for soap spillage or other liquids which might make walkways slippery. As with showers, pool users are expected to assume a certain amount of risk due to the possibility of slipping on a wet surface. Make sure nothing adds to the risk, however, such as algae, hoses, mats and other slipping and tripping hazards. Swimming pools add a tremendous amount of risk to your facility; ensure all of the proper signage is posted and maintained, and all lifeguards and personnel are properly trained and alert. Injuries caused by weight lifters failing to use a spotter are a major cause for concern. Make sure instructions on proper lifting techniques and warning signs requiring a spotter for certain types of lifts are clearly posted near the free weights. Have all of your machines inspected regularly for loose or frayed cables and any other damage or impending failures. Make sure your staff is well trained on how to decommission machines that are not in perfect working order so that a gym member does not inadvertently attempt to use it. Make sure treadmills are strategically placed to reduce the possibility of a gym member stumbling and being thrown into a wall (it’s happened). If you cannot feasibly reposition a treadmill, at least put some padding on the wall behind it. There is no way to mitigate all of the risks involved in utilizing a fitness center; however the courts recognize this and will use a “reasonable man” approach to deciding fault. If you have taken all of the precautions that any reasonable person would and should in order to ensure the safety of your gym members, then you have nothing to worry about. What is your procedure on minimizing risks at your facility? Greetings, I think your blog may be having internet browser compatibility issues. Whenever I take a look at your site in Safari, it looks fine but when opening in Internet Explorer, it has some overlapping issues. I merely wanted to provide you with a quick heads up! Apart from that, wonderful site! I value you visiting my blog and appreciate informing me of the issues the blog is having with internet explorer. I will be looking into how to resolve it soon. Still, I am also glad to hear that Safari is compatible. Is the main Insight site having the same compatibility issues with internet explorer? Thanks for sharing, keep feeding such informative post. Thank you Sam! We appreciate your support and feedback! Thanks Lawrence for your blog, keep up the great work. I’m honored to obtain a call from a friend when he identified the important tips shared in your site. Going through your blog article is a real wonderful experience. I would like for you the best of success as being a professional in this field. Thank you so much for the comment we are thrilled you are enjoying our blog! Best wishes to you! Thank you for the comment, we always love to hear from our readers. We also appreciate that you are sharing our content with your followers. Have a great day! I think this is among the most vital articles for me. The web site style is wonderful, the articles is really nice : D.
Thank you for the feedback and I am truly happy the article was helpful. Have a wonderful day!